Ernest D. Ashurst, II, 97, widower of Ruby Morrison Ashurst, passed Thursday, November 15, 2018. He was born May 14, 1921 in Georgetown, Kentucky to the late Kean and Betty Kemper Ashurst. Ernest was a veteran of the United States Navy, and worked as a real estate agent. He is survived by daughter, Carolyn Rockwood and her husband Chet Rockwood, son, Ernest D. Ashurst, III and his wife Tove A. Ashurst, and daughter, Betty Keebler and her husband Fred Keebler. 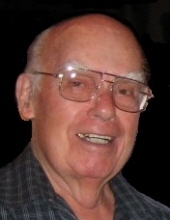 Ernest is survived by his grandchildren, Carrie Serrano, Ernest D. Ashurst, IV, Michelle Ashurst Morin, Eric K. Ashurst, Heather Keebler-Karberg and her husband Michael Karberg and Shawn F. Keebler; great grandchildren, Raymond Haynes, Jr., Robert Serrano, Jr., Alicia Haynes, Vanessa Haynes, Alexander M. Ashurst, Kayleigh N. Ashurst, Addison Michelle Karberg, and Paige Alice Karberg, and great great grandson, Cole Serrano. To send flowers or a remembrance gift to the family of Ernest D. Ashurst, II, please visit our Tribute Store. "Email Address" would like to share the life celebration of Ernest D. Ashurst, II. Click on the "link" to go to share a favorite memory or leave a condolence message for the family.